Governor Mark Dayton, Lt. Governor Tina Smith, President of the Minnesota Turkey Research and Promotion Council Kim Halvorson (center left), and Douglas County 4H member Katie Kent (center right) kick off Minnesota’s Thanksgiving festivities at the Minnesota State Capitol. 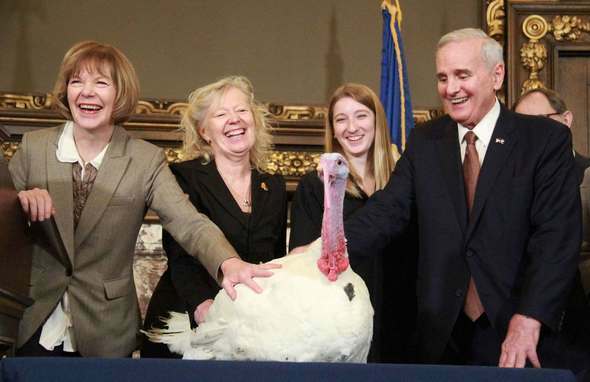 They are joined by a 45-pound Minnesota-grown turkey named “Truman” from Alexandria, Minnesota. This year marks the 70th anniversary of the first-ever National Thanksgiving Turkey Ceremony, hosted by President Harry Truman in 1947. Minnesota’s 450 turkey farmers raise an estimated 46 million birds in a typical year. This production generates $807 million in economic activity every year, and supports 26,000 Minnesota jobs. Turkeys grown in Minnesota also consume $163 million of corn and $169 million of soybean meal – adding approximately $251 million to the value of corn and soybeans in Minnesota. In south central Minnesota the largest number of cover crop acres is being claimed by members of the Southern Minnesota Beet Sugar Co-op in Renville County. Since 2000, the co-op’s spring cover crop program has expanded to include more than 80 percent of its total of about 120,000 member acres. While most of the co-op's cover crop acres are planted in spring, some growers are trying fall cover crops, which offer greater benefits. The co-op's research and monitoring show an average yield increase of $50 per acre on cover crop fields. “We now understand that it’s good for both the beets and the soil,” says Todd Geselius, vice president of agriculture. 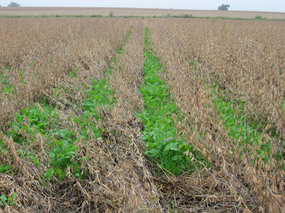 Growers receive $4 per acre from the co-op for cover crop seeds, and can also seek technical and financial assistance for fall-planted cover crops from the Renville County SWCD office and Hawk Creek Watershed Project. Most of the co-op's cover crops are being planted in spring, which protects emerging beet plants. Fall-planted cover crops extend the benefits to soil over the winter. The Renville SWCD/Hawk Creek Watershed cost-share program is for fall cover crops to protect the soil, build soil health, feed soil biology, suppress weeds and improve soil structure. "Our program is to provide financial assistance for local farmers to seed a fall cover crop to keep the soil covered through the fall, winter, spring," says Holly Hatlewick of the Renville SWCD. Renville County producers using fall cover crops are reporting a five- to seven-bushel yield increase on their cash crops the growing season after they have a fall cover crop, Hatlewick says. St. Paul – Under an agreement between the Minnesota Dept. of Agriculture (MDA) and the Barataria-Terrebonne National Estuary Program in Louisiana, eligibility for loans to implement Agricultural Best Management Practices (AgBMP) in Minnesota will be expanded to include larger livestock operations. The Barataria-Terrebonne National Estuary has developed a Comprehensive Conservation Management Plan recommending practices that can be implemented from the headwaters of the Mississippi River to the delta that will ultimately reduce sediment and nutrient loading to the estuary area and the gulf. With Minnesota’s formal recognition of the Barataria-Terrebonne management plan, eligibility for the MDA’s AgBMP loan program will be expanded to include livestock operations holding National Pollution Discharge Elimination System (NPDES) permits or those operations with more than 1,000 animal units. MDA news release, Nov. 20, 2017. For some livestock producers this year’s late fall harvest crunches the time available for spreading manure from brimming storage basins. The Minnesota Pollution Control Agency urges Livestock producers to contact the State Duty Officer (1-800-422-0798) to report if their basin is full or nearly so. The MPCA and County Feedlot Officers (CFOs) also want to hear from producers who may have storage room to spare for emergency use. The MPCA and CFOs can provide advice on best management practices for farmers to minimize impacts. Tips on bad weather manure management are available in the Managing manure, land application during adverse weather conditions fact sheet. 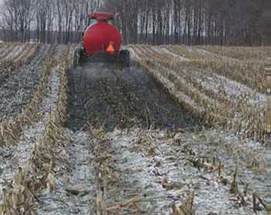 Farmers who apply manure during winter should review their manure management plan now to determine which fields are the most suitable to receive winter applications. If frozen soil prevents incorporating manure, a 300-foot setback from sensitive features is required. Fields for winter application should be level, distant from sensitive features, and have crop residue. Avoid spreading when furrows contain ice or snow. Livestock operations of all sizes should avoid spreading manure during March and February when snowmelt or rain runoff can occur when the ground is still frozen. Wisconsin Discovery Farm’s field scale research has determined that manure applied during March and February has highest chance of runoff. 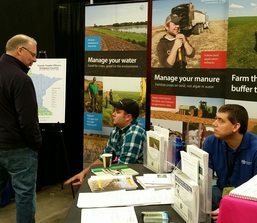 MPCA feedlot program staff will be participating in trade shows at several upcoming conventions: Dairy Expo, Nov. 28-29 at Treasure Island near Red Wing; Minnesota State Cattlemen's Association, Dec. 1-2 at the DoubleTree hotel in Bloomington, Minnesota Association of Soil and Water Conservation Districts, Dec. 4-5 at the DoubleTree; and Pork Congress, Jan. 16-17 at the Minneapolis Convention Center. Feedlot program staff welcome and appreciate the opportunity to talk with livestock producers, answer questions, and provide forms and information about permitting, manure management, and other program topics. Everyone is welcome to stop by just to visit or get the latest news and updates. Photo: George Schwint, right, and William Martens talk with a visitor at the 2017 Pork Congress. Erin Cortus joined the Bioproducts and Biosystems Engineering Department of University of Minnesota in August 2017. Her position as Assistant Professor and Extension Engineer will provide engineering expertise in the area of sustainable animal agriculture systems. Erin's research interests are the measurement and estimation of farm-level gas emissions, like ammonia and hydrogen sulfide, and the related impacts on the animals, workers and surrounding community. Erin was born and raised in Saskatchewan, Canada. She completed her Agricultural Engineering degree and PhD degree programs at the University of Saskatchewan. Throughout her undergraduate and graduate programs, she worked and studied at the Prairie Swine Centre near Saskatoon, SK. Joel Larson will be the next associate director of the U of M Water Resources Center, effective Jan. 29. Since March he has been acting director of the USDA's Southeast Climate Hub, where he leads a team that coordinates with university Extension and other science programs to provide stakeholder-relevant education on conservation planning related to climate change and water management. Since 2014, Joel has been an analyst for the climate program, leading efforts across USDA to integrate climate change into natural resource decision-making. Before coming to USDA, he served as chief of staff, adviser and social scientist in the U.S. Dept. of the Interior. He is a U of M alumnus, holding a Master of Public Policy degree from the Humphrey School of Public Affairs. He earned his bachelor’s degree in geography from Macalester College. As associate director Joel will oversee and manage the WRC’s outreach efforts and Extension water programs. He will serve as program leader of the Extension Water Resources team and will manage the WRC’s professional training and certification programs. He also will provide overall management for WRC operations including the integration of research, education, and Extension activities. What setback distance is required to reduce the concentration of manure constituents in runoff to background values? John E. Gilley, Aaron J. Sindelar, and Bryan L. Woodbury, researchers with the USDA-Agricultural Research Service, examined the effects of setback distance on concentrations of selected constituents in runoff following land application of beef cattle manure to a site in southeast Nebraska. Continue reading. Ten continuing education credits will be available at the conservation tillage conference Dec. 5-6 in Willmar. Learn how heavier, colder soils aren’t necessarily the challenge they’re made out to be. Hear from long-time no-till and reduced tillage farmers as they share their experiences. The conference will open with a keynote address from Jerry Hatfield, director of the ARS National Laboratory for Agriculture and the Environment. More than 20 vendors representing equipment, and providing educational information will be on-site both days. After Nov. 21 the fee is $180 for the full conference. Register online at DIGtheCTC.com or call 320-235-0726 x2001. Nov. 28: Watershed Network fall meeting, 9 a.m.-noon, New Ulm DNR office. Nov. 29-Dec. 2: Minnesota Association of Watershed Districts convention, Arrowwood, Alexandria. Nov. 30-Dec. 2: Minnesota Cattle Industry convention, DoubleTree Hotel, Bloomington. Dec. 1-2: ND-Minn. Joint Lamb and Wool Producers convention, West Fargo. Dec. 3-5: Minnesota Association of SWCDs convention, DoubleTree, Bloomington. Dec. 5-6: Conservation tillage conference, Willmar.Nov. 28-29: Minnesota Milk Conference and Expo, Treasure Island Resort and Casino, Welch. Jan. 11-12: Minnesota Organic Conference, Rivers Edge Convention Center, St. Cloud. Jan. 16-17: Minnesota Pork Congress, Minneapolis Convention Center. The MPCA Feedlot Update welcomes news from partners about, projects, people, and upcoming events. Email submissions to forrest.peterson@state.mn.us. Past issues of Feedlot Update are available on the feedlot program publications webpage.